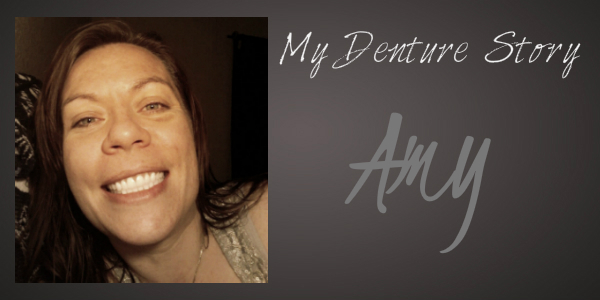 Amy’s Denture Story | iweardentures! I am a married mother of 3 with a full time job and a passion for bellydance. I recently had 25 teeth extracted (well, 24 1/2 … one tooth was already half-pulled by my FORMER dentist; long story there). Honestly, I can’t pinpoint a single ‘smoking gun’, and this is going to be LONG…. I have had dental problems since childhood. I have memories of numerous trips to the dentist for fillings from a very early age. I definitely developed a fear of going to the dentist. When I became an adult, I wasn’t able to afford regular dental visits, but did my best to keep my teeth clean. Things were fairly OK until just before the birth of my third child at age 24. One of my back teeth cracked and was deemed unsaveable. I opted to have it pulled. Fast forward 2-3 years later. I began to have decay at the gumlines of most of my back teeth. I went to a dentist and got the cavities filled and a deep cleaning. From then on, my problems rapidly worsened. One tooth after another was decaying from the inside out. On the surface, the teeth generally looked intact. inside was a different story. In my early to mid 30’s, I had a series of root canals and crowns in an attempt to save my remaining back teeth. One by one, those failed and needed redoing. I sought care from a different dentist who told me I had been ‘mistreated’. Well, nothing I could do to change that. By that time, the roots of several of the root-canaled teeth had developed small fractures, either due to shoddy work, bad luck, whatever… They were constantly infected. My front teeth, which until this point had looked “OK”, started showing visible signs of decay, so I started getting little fillings here and there, which would fall out and need to be redone. I don’t remember the exact order of events leading to the proverbial ‘straw that broke the camel’s back’, but in July 2012, I had lost another filling, this time in a maxillary canine tooth. I opted to have ANOTHER root canal. First, it was poorly done, leaving a very tender spot next to my nose. I later learned that it was actually an abscess. The crown never fit right, and would come off several times between then and E-Day. In February 2013, I went in to have YET ANOTHER tooth root canaled – this one had been filled years ago with an amalgam filling and it had fallen out. I probably waited too long to get it taken care of, but it was difficult to numb because of infection. In fact, the dentist had to drill a little, then drip in the anesthetic, drill a little more, drip a little more in, etc. When the canals were opened up, they kept oozing blood and pus, so he left it unfinished, packed the canals with a temporary gauze and temp. filling, and told me to come back in 2 weeks to get the root canal finished. I was gentle on that side of my mouth, however, before I could get back in, the tooth cracked all the way below the gumline, so much that the packing came out. The tooth was no longer saveable, so he went to pull it. Again, the tooth would not numb. I (stupidly) asked for nitrous and told him to just yank it… I was tired and just wanted the stupid thing out. After trying again, it was obvious the tooth was NOT letting go, and I was in absolute agony. They told me to see an oral surgeon and sent me home with a prescription for Vicoden. By the time I got home, I was crying from the pain and my jaw had started swelling. My husband went to fill my pain medicine and couldn’t because the dentist had not specified a strength (apparently Vicoden now comes in multiple strengths)… By the time the pharmacy called the office, they were closed, and the answering service was NOT willing to contact the dentist. We managed to get my pain under control that night, and called the dental office first thing in the morning. I also asked for antibiotics because of the facial swelling and awful-smelling discharge from the half-filled tooth socket. I visited a couple of clinics specializing in dentures/implants and researched a LOT. I had been looking at partial dentures for several months beforehand, but after more than one dentist told me my teeth were either not salvageable or would be enormously expensive to save, I decided enough was enough, and chose to have them all extracted. I had the option of keeping a few bottom teeth, but two things kept me from doing that: I grind/clench, especially at night, and I would end up seriously injuring myself. Second, the remaining teeth were not incredibly healthy, and I was afraid I’d just end up losing them in a few years anyway. So, after some deliberation, and again more research, I made the decision and had the extractions done on March 15, 2013. How did you find your current dentist and why did you choose him/her? How much did/will the procedure cost? The entire procedure was approximately $5000. My insurance covered about $950 and I put the rest on CareCredit. What were your feelings before getting dentures, if it applies? I was afraid that people would assume I was unclean, “trashy”, a drug user… I am none of those things – just “blessed” with crappy teeth. I know I could have done things differently early on and perhaps avoided this, but it’s always easy to look back and say “could have, should have”. I was angry that restoring my natural teeth was financially impossible, and physically impossible in some cases. Have those feelings changed? If yes, how so? I no longer worry about what people think. I am still slightly angry, but I am working on accepting all of this. It’s been almost 1 month as a write this, so I imagine I have a few more emotional twists and turns ahead of me. What type of challenges do you face? Share any strategies you might have for handling these problems. I had pretty significant swelling and bruising after the extractions; an unusual amount from what I am told, but it went away pretty fast. I used moist heat the help the bruising disappear faster. I still grind/clench. It seems to be worse right now with the dentures. I am not sure if it’s because I’m still getting used to them, or because my bite feels “high”. I’m not sure how to address that, but am going to talk to the dentist at my next appointment. Describe your support system, if you have one. He is very supportive and has been since the beginning. He also wears dentures – full upper and partial lower. What is your care regimen, both at home and dental visits? My family and friends have been very supportive and understanding. I brush with a soft toothbrush after meals (no toothpaste), then rinse with mouthwash. At night, I remove them and brush my gums/mouth with a soft toothbrush and baking soda toothpaste. I sleep without them, and soak them with a tablet, then scrub them all over with a denture brush in the morning before reinserting them. Excellent denture story Amy. I appreciate hearing all the details. I often see young women with similar oral health problems and, if they come to me early enough, we can often save their natural teeth. It is impossible to determine the reason why you had such a rapid decay. Some people are genetically predisposed, and this is nothing to be ashamed of. Your decision to opt for the extraction of all remaining teeth and full dentures is understandable. Thank you for bravely sharing your story.